Wake Up London was founded in September 2010 by a group of friends that met on a retreat in Nottingham with Thich Nhat Hanh in August that same year. Feeling inspired by our experience on the retreat and our time together, we wanted to keep our practice of mindfulness alive and invite other young people to join us. 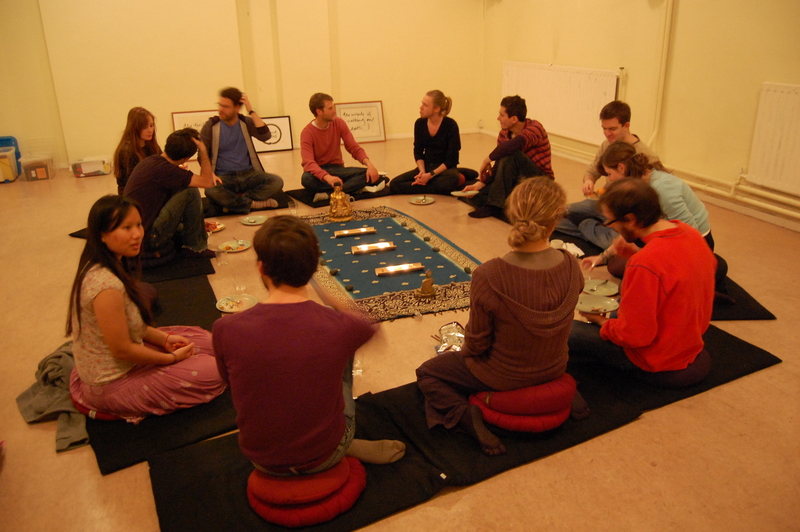 We refer to ourselves as a “Sangha” – which means a community of people who practice mindfulness together. We are part of Wake Up, an active global community and movement that was founded by Thich Nhat Hanh in the Plum Village Meditation Centre, south-west France in 2008. We come together to practice mindfulness in order to take care of ourselves, nourish happiness and contribute to building a healthier and a more compassionate society. We have been meeting every week at the Quaker Meeting House in Central London. We are grateful for the support of our sister community, the Heart of London sangha, for their support, guidance and resources to help make our meetings happen. The Five Mindfulness Trainings are at the foundation of our practice. They are ethical guidelines that offer concrete practices for developing a path of happiness, compassion and harmony with each other and the planet. See Mindfulness for more information on our practices. We aspire to be a place of refuge, nourishment and support for young people. Our age range is roughly 16 to 35ish. We want to provide a unique space for young people to practice together and share deeply from the heart whenever that feels needed. Practising together as a community of friends, we can create a strong collective energy of mindfulness that can nourish our joy, heal our pains, develop our understanding and love and cultivate peace within and around us. We gather weekly to practice sitting and walking meditation, to listen to a teaching, practice deep relaxation, mindful movements, mindful speaking and listening, and recite the Five Mindfulness Trainings. We organize and attend retreats to refresh and strengthen our practice. We organize “meditation flash mobs” to promote meditation, peace and unity in the city. Hanh, our community is not exclusively Buddhist. Mindfulness is a capacity that we all have as human beings. Our community is focused on practice and not on beliefs or ideology. We honour the unique roots of every individual and you can join as a Buddhist, Christian, Hindu, Jew, or Muslim as well as an agnostic, atheist or member of any other religious or spiritual grouping.